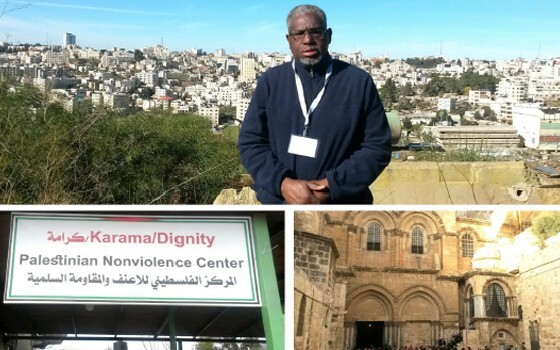 The following piece was written by Imam Mustafa El-Amin, a participant on the The Jewish Federation in the Heart of New Jersey's recent Interfaith Clergy Mission to Israel. It originally appeared in the Muslim Journal, February 9, 2018. Makkah, Madinah and Jerusalem are the three most sacred sites for us as Muslims in Islam. Having performed Hajj in 1992 and traveling to Madinah as well, it was a deeply heartfelt honor and blessing to have the opportunity to travel to Jerusalem along with a diverse interfaith clergy group consisted of two Muslims, myself and Mohammad Ali Chaudry, Pakistani of Basking Ridge New Jersey, four Rabbis and fourteen Christian Pastors of various denominations and to attend Jumah and pray at Masjid Al-Aqsa and to spend time inside the Dome of the Rock. The Muslims there refer to the area as Al-Haram Al­Sharif and the Jews refer to it as Temple Mount because they associate it with Solomon's Temple as well as other reasons. Nevertheless, it is considered a very special and sacred area by both. Prior to that, we had visited the Holocaust Memorial. Actually, we left there and caught a cab to the Masjid for Jumah. The cab driver was Palestinian, who shared good information with us. The journey was well organized by Keith Krivitzky and Dan Rozett of The Jewish Federation in The Heart of New Jersey. It is important to note that I was invited by a Rabbi whom I greatly respect and have developed an honest, open and brotherly relationship with over the last couple of years. Rabbi Marc Kline of Monmouth Reform Temple in Tinton Falls New Jersey and I were both speakers at an interfaith program celebrating Muhammad the Prophet (saw), at Rutgers University, sponsored by Muslims 4 Peace organization. During Rabbi Kline's presentation, he spent a considerable amount of time talking about the transition of the African American Muslim community from the teachings of the Nation of Islam to the universal teachings of Islam under the leadership of Imam Warith Deen Mohammed. He indicated that he had actually met Imam Mohammed and expressed his admiration, love and respect for Imam Mohammed as a person and his great works. The overwhelming majority of the audience was non-African American. I mention that, because I believe Rabbi Kline would have said the same thing - rather I was there or any of us from Masjid Ibrahim or any other African American Muslim was present. I have participated in an interfaith event at the Synagogue that he presides over. Since we returned from Israel, I asked Rabbi Kline where did he meet Imam Mohammed. He replied, "I was with Imam Muhammad in Columbia, South Carolina in the late 90s. He and I shared a program with an Episcopal Elder who was a dean of one of the colleges. "We were speaking about the similarities of our faith traditions. I will share with you that not only did I appreciate spending the time with the Imam, but the room's aura changed when he walked in. He was a dynamic man, and I wished that I had had more time and opportunity to spend with him." I was thankful to receive an invitation to travel with him and other leaders in the Faith community on a "Clergy Interfaith Mission to Israel" - not just for myself only but for our community. I immediately reflected on the fact that Imam Mohammed had gone to Israel. Prior to going I remember him being in Newark at Masjid Muhammad, as it was known then, and asking the community what did we think about him going to Israel. As I continue to process and reflect on what I experienced and learned while in Israel and a few of the Palestinian territories, as well as the historic sites that we visited that are sacred to Muslims, Christians and Jews, I have to be thankful for the depth of the itinerary that we followed almost to the letter for the seven days that we were there. It was extensive and a grind. From the first day to the last, we were constantly being educated by early morning presentations by both Jewish and Palestinian speakers concerning the reality of the complicated situation that exist between the two and the possibilities for hope and peace - as well as presentations by Christian speakers. The daily routine was to visit a number of historic sites locations, like Shilo, Nazareth to visit the Church of Annunciation where many Christians believe is the area where Mary the Mother of Jesus lived and where the Angel Gabriel told Mary that she would have a child. It included the Church of the Holy Sepulcher in Jerusalem, as well as other churches and the Western/ Wailing Wall, the Sea of Galilee, Jordan River, Jaffa/Joppa, which is the oldest part of Tel Aviv and is histor­ically associated with Jonah and Solomon. Personally, it was important to take a photo there with the Mediterranean Sea in the background because during my tenure as an educator teaching World History, there was a focus on ancient kingdoms of the Mediterranean. Before going to Jaffa, we drove through Levinsky Park for a glimpse at the realities of Israel's African refugee population and had a discussion of some of the challenges. We walked along Rothschild Boulevard, where Tel Aviv began, exploring the old and the new. The first day there, we went straight to Jerusalem where we witnessed worshippers at the Western/Wailing Wall and heard the Church bells and the Adhan being called from Masjid Al-Aqsa. It was an amazing site to see believers of the three Abrahamic Faiths basically in the same area and in spite of the deep-seated controversies, from what I could see, peacefully worshipping G-d in their own way. In addition to those sites, we went to the Golan Heights which borders Syria and Lebanon. From our location, we could see both countries and to Rawabi, a new Palestinian city near Ramallah to meet and have dialogue with Bashar el Masri, the developer of the city, a Palestinian American entrepreneur. Another very important place that we visited was the Etzion Settlement Block, Palestinian Nonviolence Center, and met the Israeli and Palestinians of Shorashim­Judhur, a grassroots project which brings together Palestinians and Jewish settlers in a realistic and unique coexistence project. We heard presentations that were very informative and hopeful, with both the Israeli and the Palestinian expressing their hurt and pain at the loss of family members at the hands of each group. They both explained that they are tired of the conflict and are doing what they can to work for real peace and understanding. In summarizing this enlightening journey, I thank Allah first and foremost, then the organizers from The Jewish Federation for their interfaith efforts to bring about greater understanding between members of the faith communities. "Together, as Jews, Christians and Muslims, we created dialogue, shared experiences, enjoyed meals together and most of all formed a bond through mutual respect and understanding for one another that will continue back in New Jersey. "We have laid the foundation to enable us to work together for a better community and maybe even a better world. I could not have asked for a better outcome!" It was truly an educational and thought-provoking experience that I will never forget. The conflicts and complexities of the situation between the Israelis and the Palestinians in such a sacred place, rich in history and religion, as Jerusalem and the surrounding areas, in my opinion can only be resolved by themselves by Allah's Permission. Israel is an inspiration to all who visit. Experience Israel for yourself on the Jewish Federation in the Heart of New Jersey's 'Four Corners of Israel' community trip, October 14-22. LEARN MORE.